It was all part of the same plan. The only thing different is that the representation in the August minutes* that this would be effective Nov. 24 apparently did not come to pass. 2013 was the Sunday prior to Thanksgiving and the date is affected by the schedule for the division pick[ed]. Might also take into consideration that there may or may not be additional changes outside of North that might warrant a "all-in-one" revision that justifies a move. Keep in mind, you have to input all of changes into scheduling, then to Google Maps, and their IBS. doing things piecemeal may not be conducive to the entire scope. There may be a general need to update software data, but the Waukegan restructuring was a separate project requiring board approval. For that matter, Pace still has to get 924 and 925 out of its system tonight, although that never showed up on WebWatch. From Pace via Facebook... Please see the car cards (ads in the interior of the bus) to see how the North restructuring will affect riders in Lake County. All changes will be in effect as of December 22nd or 23rd. I was told by a driver at Pace, that the 565 and 571 will not be in the lineup at Washington and Sheridan anymore. I think that is what they mean by some transfers on Washington Street. That reminds me of when I moved to Waukegan in 2004. The 562 and 572 would sit on Washington facing west while the other buses met around the corner. By 2005 this was changed to the current setup. Seems like a major step backwards. The thing I couldn't figure out is how the passengers could tolerate standing on, essentially, unprotected lakefront on Sheridan Road waiting for the bus, especially in winter. Finally a mention on Pace's website.However, it says that is is only Phase 1, and doesn't say what Phase 2, scheduled in March, is supposed to be. Some taxicab drivers have figured out in cold weather, driving slow past the terminal, usually results in a passenger. They technically are not supposed to do that, but really, who cares? Especially before Pace put up a shelter for the passengers, nobody really minded, and before Pace put up an actual bus stop sign at the terminal, which was only in the past couple years, there was nothing technically stopping cabbies from doing that. Maps and schedules are now posted on the Passenger Notices. 272 weekdays has far fewer J trips (interlined with 270). I wonder if that indicates that it will be a more North division route. Saturday is unaffected (just about all interlined). 565 has confusing T and C notations to either transfer at Washington and Sheridan, or wait until it goes into the Metra station and transfer at Sheridan. I wonder what the rationale for that is. 570, besides the announced cutback to Rollins Road on Saturday has circular service, to be on Rollins Road on Saturday, one way in the morning and another in the afternoon. No real explanation what they are serving, although a KMart and Aldi are shown on the map. One 572 school trip each way still goes to Mundelein. 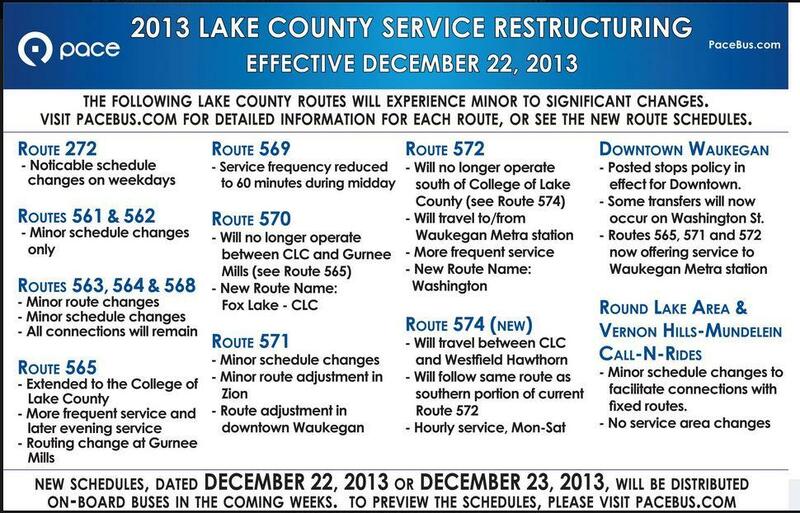 Nothing apparently up yet for 574, Vernon Hills C&R, or what phase 2 is supposed to be. Here's the 574 front & back. Along with the 565, 572 also have those notations as well. Only difference is that 572 have more Cs and 565 have more Ts. I assume the ones with the Ts that the buses is probably laying over at the Metra station, while many of the other routes are laying over at Washington & Sheridan. And the Cs are probably going into the station and then come back out and layover at Sheridan. pacebus.com seems to be going through healtcare.gov hiccups at the moment, but the thing that is obvious from the 574 schedule is that the weekday schedule implies 50 minute layovers on both ends of the route [in that a bus departs something like 8 minutes before a bus arrives], which certainly is inefficient, leading me to believe that it is still interlined with 572 on the CLC end. However, that still doesn't explain the ones on the Hawthorn side. Update: After contemplation, it appears likely that 574 is interlined with 272 on the Hawthorn side, which also would explain why the number of J trips (270 interlines) is down. If that's the case, that's an awful long round trip (about 4 hours). The 572 schedule, indicates a similar pattern at CLC, and it appears that the 574 arrivals match the 572 departures, except that 572 runs every half hour but 574 runs once an hour. But that seems to be explained by an interline of 572 with 570. In short, I'm not sure if Pace saved anything splitting 572 and 574, but apparently this did get the frequency on 572 increased to every half hour throughout weekdays. BTW, how did you find it, since it wasn't obvious based on the Passenger Notices or Route Finder search? Confirming my suspicions above, there is also a Passenger Notice for 270 that the schedule will change because certain weekday northbound buses will no longer go to 272. Since Golf Mill is one of the more obvious places where the published schedule indicates that bus departs before it arrives (but that is affected by various interlines), it will be interesting to see how they work that out, considering that there will still be Glenbrook Hospital trips. 270 front/back. Only one northbound 270 trip in the morning is going all the way to Hawthorn. Other than that, the basic concept is unchanged. Looking say at weekday midday at Golf Mill, the Glenbrook bus arrives NB at :27 and arrives southbound at :17, leaves at :22. That's only relevant as a reference mark, but the same holds true for the next bus that might have been interlined with 272, which arrives NB and :47 but leaves SB at :42. While it was always open what they did with the :07 :02 bus, it might be that it sits at Golf Mill for 35 minutes to make the :42 trip, but I tend to doubt it. Update: Of course there will be garage trips and lunch breaks. ...I assume the ones with the Ts that the buses is probably laying over at the Metra station, while many of the other routes are laying over at Washington & Sheridan. And the Cs are probably going into the station and then come back out and layover at Sheridan. Giving this more thought, I suppose a bit differently. 572 has been divorced from the usual pulse point time of :02 and goes straight on Washington rather than looping via Sheridan. The more obvious conclusion is that since the vast majority of 272s are Cs, they become 565s at the Metra station. However, at this point I'm too lazy to trace the schedules. 272 is run by both NW and North. North Division buses are interlined with (one run of) 572 and 574. Northwest is run independently from 270 (except for the one interline in the AM and PM rush). Oddly enough, the PM hours are predominantly run by North. It is possible for 270 buses to wait for 272 transfers at Golf Mill, however. But it looks based on the advance schedules that NW will run only one round trip weekdays, but will retain all Saturday runs (interlined with 270). 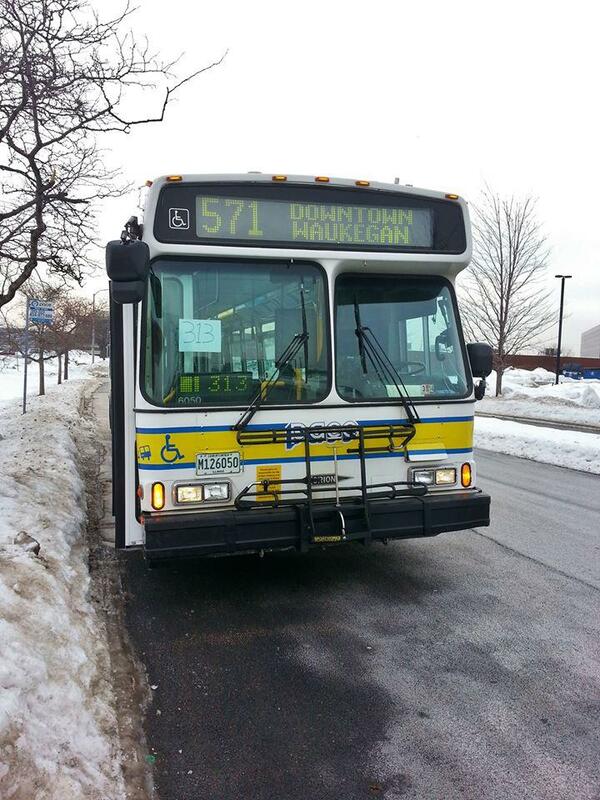 At CLC, some of those 565's are interlined with 572 (also at Waukegan). Jack noted correctly. The 574's may be connected to the 570's AND 272's, depending on the run and departure points. I'll have to amend that, in that there are NW buses when 272 runs every half hour. Will have to see what it is early afternoon. Apparently phase 2 is an increase in service on 571 to once every half hour, and Sunday service. Passenger Notice. Unfortunately, unless this is evidence (from a couple of weeks ago) that there is going to be a swap to get NABIs back to W, the windshield sign, and bus stop sign* indicate some sort of programming malfunction. ** So, what's the context? *I had to really blow it up, but it appears to be in Uppers Grove, with the Yorktown routes on it. This was simply a sign malfunction... trust me, no swaps involving West are happening at the moment. I assumed that, but people also have said here that Pace buses are programmed for specific divisions or operators. Someone stick the wrong thumb drive (or whatever) in the sign controller? That's quite right jesi2282, I'm sorry I couldn't resist with it being April Fools Day. I believe the story behind that was someone was messing with the signs and got this sign to show up. That picture's from February I think. Notice the foot plus of snow on the ground! !